Using a hammer and a handheld die, one can stamp a letter or numeral into a metal surface. Sets of alphanumeric dies for this purpose are widely available (example). When two or more characters are to be stamped, it can be tricky to get the impressed letters to be uniformly spaced and horizontally aligned. I made a device to support this process. It consists of a grooved Spacing Template and a Block that slides over the Spacing Template. 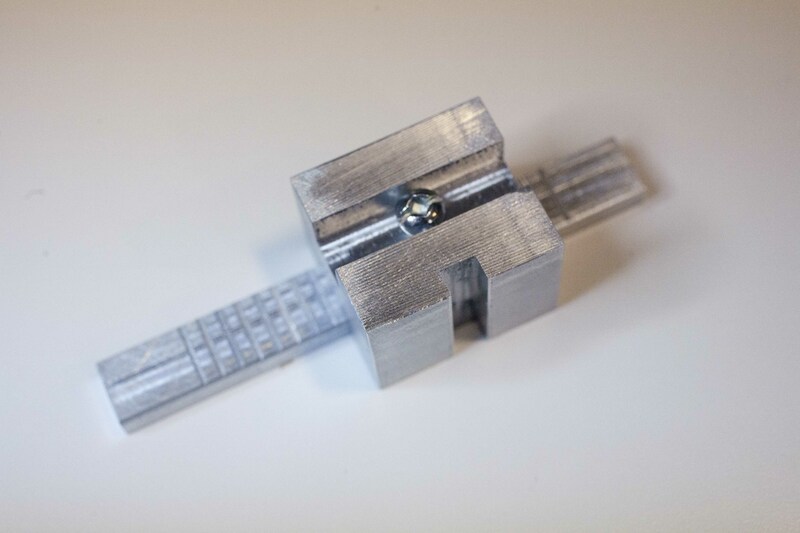 A pointed Screw projecting downward from the Block engages the grooves of the Spacing Template, so that the Block can be moved along the Spacing Template in discrete steps. A groove in the front of the Block aligns the die. Plans for the stamping guide are here; you'll need Google Sketchup 8, but the only features used were those of the free version. 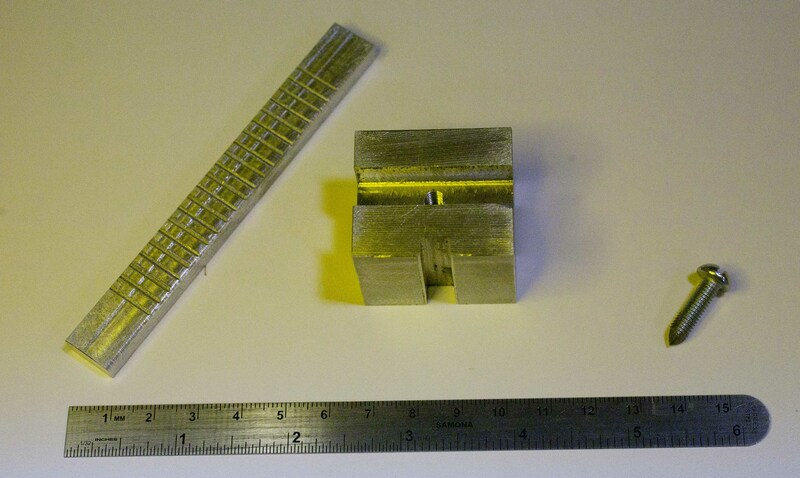 The stems of my stamping dies are roughly square in cross section, and the stems' widths range from 0.2508" to 0.2538". Also, each stem turned out to be subtly swollen near the business end, where the widths ranged up to 0.2632". The vertical groove on the front of the Block was made just wide enough to provide a sliding fit for the fattest of these these dies, and sufficiently shallow that a portion of the die will protrude from the surface, to be stabilized by the user's thumb. Using my die set, center-to-center letter spacing of 0.14" looks good to my eye, so that is the spacing of the grooves in the Spacing Template. 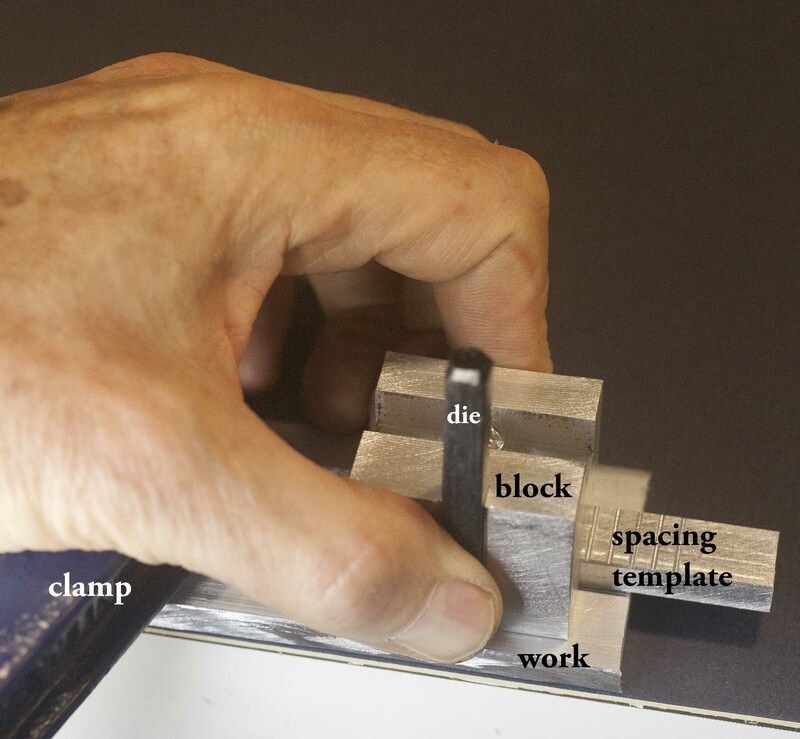 To use the guide, I clamp the Spacing Template to the work and then move the Block along it, letting the point of the Screw fall into successive grooves.